People are surprised to find out that I’m not actually from here. The standard conversation after the holidays goes: “You went all the way back to Bangladesh? So, your entire family is there? Oh, you lived there till you were 19?” And then of course: “But you speak English so well!” My brown skin and third world citizenship hide the international school education that I was privileged to receive. A childhood of Scooby Doo and Friends makes my accent familiar enough to go unnoticed. Alas, passing privilege does not an American make. Right? 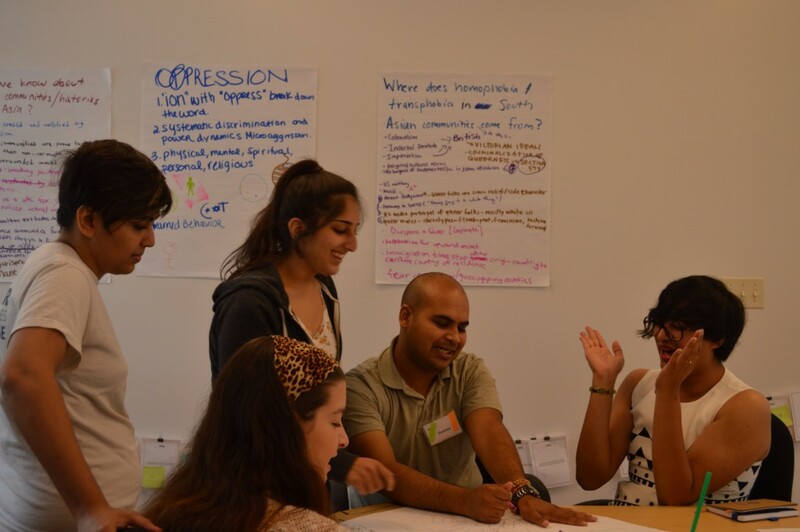 I was thrilled to learn that a group called South Asian Americans Leading Together (SAALT) was hosting a LGBTQ-themed summer leadership institute. It boggled my mind that I might actually meet other queer and gender variant deshi students interested in creating change. But surely I wouldn’t be eligible—many semesters as a student worker in the career services office had taught me to expect a “U.S. citizens and permanent residents” clause hidden in the eligibility section. Imagine my surprise when the Young Leaders Institute (YLI) explicitly welcomed “diversity in regard to [among other things] immigration status.” As I hurriedly pulled together the application, I asked myself for the first time: Did this put me under the umbrella of South Asian American? Was it enough to self-identify as American? Legal papers are a poor measure of identity, but I had only ever considered this line of reasoning in the context of undocumented Americans who have lived here for years. My acceptance into a college (and the financial aid that came with it) gave me the privilege of a legal avenue of entry to the Land of Opportunity not afforded to them. I was not compelled by circumstances at home to risk arrest by ICE, or worse, incur the wrath of my punctilious father. Yet, after five very formative years in the United States, the process of my integration was well under way. I could no longer drive on the left side of the road, I grew an invisible layer of personal space, and I could even sing most of the words to Journey’s Don’t Stop Believin’. Yet, I knew that I could “hold on to that feelin’” only for so long. There will come a time when my Duration of Status will come to an end, and I will need to go back. When I share my apprehension about this legal deadline on my stay with friends who have grown up here, they are rightly confused about the logic behind it. As a student of economics, I know that the potential gain to world GDP is much higher from eliminating barriers to immigration than barriers to trade, yet it is my body that is stopped at the border for further screening while iPods and Big Macs hop across with ease. There’s something a little hypocritical about insisting on an impermeable border while cultivating a global consumer base for all things Americana. I know, however, that the way to move forward is not through a battle of wits but by listening to each other’s stories. Stories are a powerful thing. They allow us to see our shared humanity with those different from us, and to see beauty in diversity. Stories are also a way for those of us living at the margins to claim space for ourselves. It is no surprise to me that many of my fellow YLI participants have chosen to take on projects that celebrate stories of people like us. My YLI project performance is an effort to share my story. I draw upon my own lived experiences to trace the cracked lines between being a Bangladeshi citizen, a queer deshi, and an American. I have struggled to find a way to tell my story with any degree of honesty, when I know that the lived reality of LGBQ and T* South Asians are invisible, or worse, erased. Yet, that is exactly why it needs to be told. As I toe the line between that beautiful spectacle of exhibitionism that is American performance art, and my deshi impulse to keep skeletons hidden deep inside my closet (pun intended), I remind myself of the comfort I have found in the voices of queer and trans people of colour. In turn, I hope that my story may offer some solace to my younger brothers and sisters and siblings (and cousin-brothers and cousin-sisters and cousin-siblings). Wherever they are from, I hope that they feel that they belong. So what did you tell your family? Within minutes of entering the hotel, the question came up: “So what did you tell your family?” We had only just met, but we didn’t need to know each other to know that family was a tender topic. We had come together for SAALT’s Young Leaders Institute (YLI), but our connections ran deeper than a passion for engaging South Asian communities in justice and activism. This was a connection that many LGBQ and transgender South Asians experience when we come together—a shared ache to reconcile what we knew about ourselves and what those around us have been taught. Especially achy is reconciling what our families have been taught about who they think we are. My roommate and I, exhausted from our travels but exhilarated by this rare opportunity to swap stories of family experiences with another queer desi, stayed up late the night before the first day of YLI sharing stories about what brought us here. LGBQ and transgender South Asians are taught that our families will never accept or acknowledge us in our entirety. While some of our experiences affirm this, these scare tactics leave us stuck and unable to hope for or envision a different family experience. The idea that we have no future as our whole selves is not only harmful to us, but also to our families. These fears fuel their anxieties and, in turn, widen the gap we feel between us and our families. How do we move toward a future where families have room to grow, learn, and accept us? How do we move toward a reality where being an LGBQ and/or transgender South Asian is not synonymous with a familial disconnect? How do we move toward a truth where we give our families the care we hope they can give us? One exercise we did during our YLI training really hit home for me. We were asked to make a “queer family tree” tracing the people in our lives who have made room for us to be who we are more freely. At first, this felt impossible—the stereotype of South Asians being homophobic and transphobic runs deep enough to cloud what I know to be true. I remembered confiding in a cousin of mine about my queerness and the lightness I felt when she responded with such kind words. Were there more experiences with family that made me feel free? Maybe if I looked at this another way, I would find more. I thought about all the people in my family who might share my feelings about family—stress, sadness, frustration disappointment, shame, a sense of stuckness. Though they may not be queer, there were others in my family who are negotiating the idea of “family,” family expectations, and family realities in a complex way. And there were those few who supported them. Just by being who they are, these folks are making space for me to be me. They endure gossip, shame, fear, just because they don’t meet an expectation. Our seeming imperfections give hope to others who are also told they are imperfect. Thinking about family in this way really affirmed my shifting approach to family; it reminds me to be gentler and more compassionate. It also reminded me that these stories don’t come to mind easily, that these folks are often written out of family histories. In turn, I wondered where I stood in the future of my family history. We are all storytellers, from the fictions we devise that allow us to access queer and transgender community, to the way we share the fine balance of our lives—storytelling is inherent to how we live and survive. My YLI project, an anthology entitled “Moving Truth(s): Queer and Transgender Desi Writings on Family,” captures a snapshot of how LGBQ and transgender South Asians relate to family through storytelling and explores how we get to a point where we can move forward. In honor of the vision for building allyship among each other and our families, my team and I developed a community-based publishing plan. Instead of expecting our contributors to write in isolation, we accepted applications of interest rather than submissions. Knowing how complex the topic of family would be, we created a guided writing process, a 10-week online writing workshop that would support writers in focusing which story to write about, to help in providing context, to work on editing and grammar, and, most importantly, to provide emotional support as we processed our experiences with family. Our goal during the writing and drafting process was to create something that felt true to us and our experiences, and to create something we are proud of. Some of our included stories deal with conflicts of belief and action, reconciling identities, and learning more graceful, generous, and gentle ways to relate to ourselves, our families, and our communities. Our labor of love will be published Spring 2015. To learn more about and support this project, please: http://igg.me/at/movingtruths. I decided to explore more of my racial and ethnic identity in my first year of college when the term “South Asian” was still relatively new. By reading anything I could find and observing race and ethnicity in my surroundings, I grew more interested in the role of race and ethnicity in health and health care. I learned of “public health” and other terms used to describe health conditions I witnessed my whole life, such as health disparities and negative health outcomes. Based on my personal interests and experiences, I decided that I wanted to focus on reproductive and sexual health care for South Asians and other people of color. For the past two years, I have approached this work with a reproductive justice framework and have seen how mainstream reproductive and sexual health organizations have often neglected marginalized populations, such as women of color, queer communities, people with disabilities, and all their intersections. A year ago, I took an LGBT health course, where I learned about LGBTQ health disparities, such as the high rates of breast cancer among lesbians and increasing rates of depression among transgender people. This course served as my first academic exposure to LGBTQ health from a public health perspective. Quickly, I realized that there is still much research to be done on LGBTQ health, that there is even less research on LGBTQ and people of color health, and that most people did not even know words like “queer,” “cisgender,” and “transmisogyny” exist. Knowing this, I still had reproductive and sexual health as my primary areas of interest, but could not fail to include LGBTQ health in my scope of public health. As my actions became more LGBTQ inclusive, I noticed that other students and public health professionals wondered why I used gender-neutral language, discussed health disparities at any given moment, and “brought up race and sexuality too much.” Despite the comments and stares, I still maintained my LGBTQ (and other demographic factors and identities) inclusive stance and continued my work. 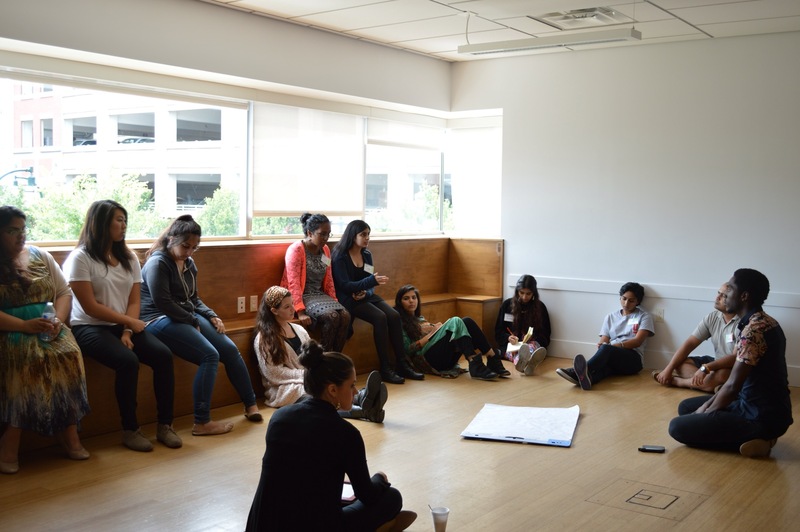 I heard about SAALT back when I was researching South Asian community engagement, and I heard about the Young Leadership Institute from a former participant. This past summer, I was fortunate enough to attend SAALT’s annual Young Leaders Institute (YLI), which, in 2014, focused on LGBTQ justice and allyship. While attending YLI, I learned about South Asian queer history, queer people of color histories, and the trajectory of South Asian, LGBTQ, and South Asian LGBTQ communities. Based on my work and the trainings at YLI, I started to critically think about integrating dominant public health practices and LGBTQ health. Though I am limited in my capacity to enact significant changes in public health practice, I wanted to start engaging more intersections of sexuality and race into public health discussions and in the scope of public health. 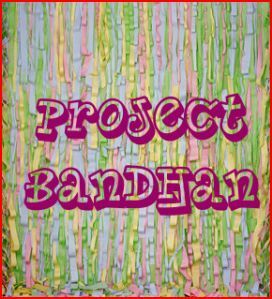 My YLI project is to incorporate LGBT health in medical and public health discussions. I plan on hosting a panel of health professionals to discuss the necessity of LGBTQ competency with current medical and public health students. An example of LGBTQ competency among health professionals is not assuming someone’s sexuality when screening for past sexual history. In addition, I plan to integrate LGBTQ health and use LGBTQ inclusive language in my current practices in reproductive and sexual health. 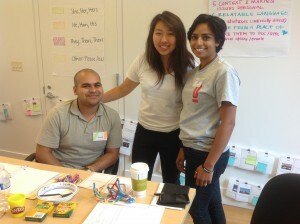 For instance, when I conduct workshops or community discussions on these topics, I explain LGBTQ inclusive language to participants and my rationale for doing so, especially in regards to the specific community to which I am addressing (such as the South Asian community, graduate students, a collective community of color, etc.). Incorporating LGBTQ inclusive language is needed in order to reduce the marginalization of LGBTQ people and promote accessibility of LGBTQ-friendly services. I plan on implementing this project this semester and want to continue integrating LGBTQ health and LGBTQ inclusive language in my work as a public health practitioner. As someone who holds queer, gender deviating, Muslim, and first generation Bangladeshi-American identities (among others), being considered unusual is common. Having conversations that include the statements, “Yes, a person can be Muslim and queer at the same time,” or “Of course, South Asian transgender people exist,” are a regular part of my life. Though these exchanges can be trying at times, I have come to realize that they are a huge necessity. Only by connecting with one another through understanding of each other’s truths can solidarity between individuals be forged. Only by educating one another can community be built. Thus, education is often on my mind, though not in the most obvious sense. I think not of the institutions typically associated with education, not the schools or universities, but the idea of spreading knowledge and understanding through populations in less structured environments. I wonder how stories can be shared and community built without the support of larger systems to create channels of communication. As referenced above, individual conversations can be powerful tools for community building, but as someone who is a both part of and works within South Asian LGBTQ communities, I am often searching for ways of reaching more people, more efficiently. 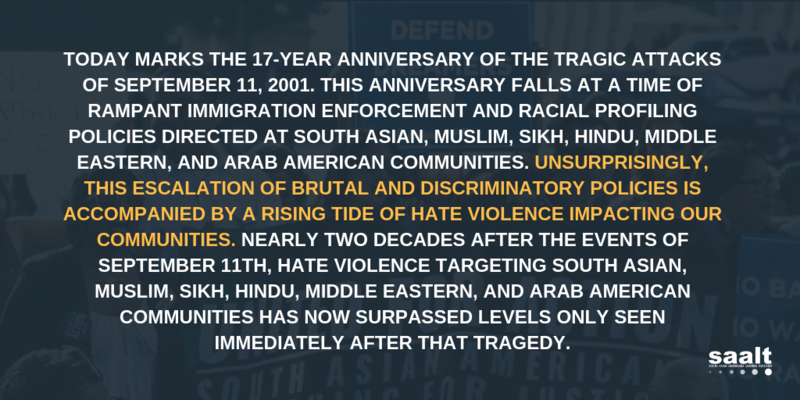 Enter the Young Leader’s Institute (YLI), hosted by South Asians Leading Together (SAALT), which I attended in 2014. The opportunity is one that that I don’t often come across; I was able not only to gain practical knowledge on doing advocacy work in marginalized communities, but was also connected with professionals involved in justice work and given space to share experiences with peers. It was dee ply fulfilling to be in an intentional space with a clear focus on LGBTQ justice and allyship. After various trainings on issues ranging from the effect of colonialism on gender norms in South Asia to methods for completing projects, the importance of particular issues became clear to me. Sharing truths, creating understanding, and reaching across difference were themes that came up again and again over the three days of the Institute. Here, it seemed, was the issue with which I had been grappling: how to spread awareness and better serve communities by understanding their specific needs. With the guidance of SAALT staff and in partnership with Satrang, a South Asian nonprofit that serves LGBTQ communities based in Southern California, I decided to focus my efforts on building allyship trainings focused on the needs of South Asian LGBTQ-identified people. 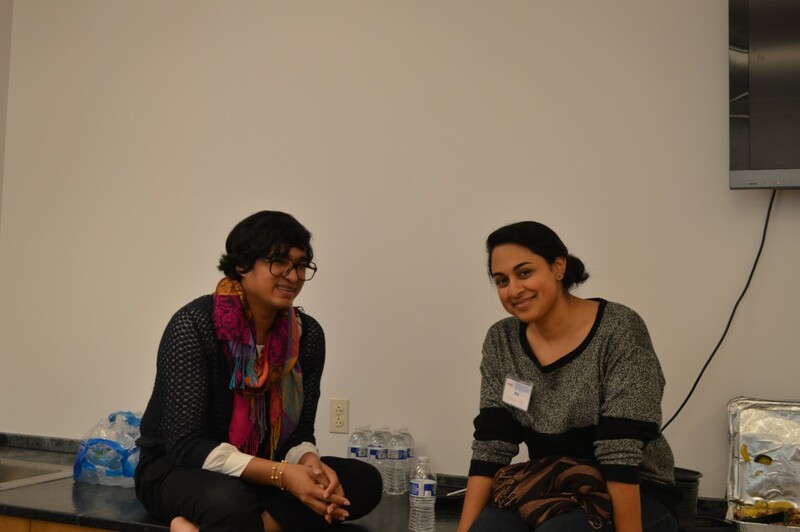 The allyship trainings are a series of six to eight workshops that will be held over a six month period, and will target professionals and other groups that work with South Asian LGBTQ communities, such as immigration lawyers, social workers, journalists, medical professionals, and possibly student groups. The trainings consist of an overview of South Asian LGBTQ history and relevant current issues within these communities and a more general section on LGBTQ-related terminology and concepts. The idea is to give people working with Desi LGBTQ-identified people the tools to better understand their needs and ultimately better serve these communities. In conjunction with the trainings, I am working to develop a resource toolkit. Resources, such as literature on gender identity and needs assessment research on South Asian LGBTQ communities, will be both handed out at trainings and available on Satrang’s website so they are accessible to those who are unable to attend trainings. Thus far, the project has proven both challenging and rewarding as I focus on developing the training curriculum. Reaching out to individuals and organizations involved in LGBTQ justice work has proven very helpful, not just in completing the project but in helping to develop my own approach to allyship. Often, when one thinks of allyship, the gist is to support individuals with different identities than your own. However, I have come to realize that it is important to be an ally to one’s own community. For me, that means educating myself on the needs of folks in my personal and professional life and using whatever skills I possess to improve conditions for others. Though I can’t work in immigration and the media and the medical field, I can give the people who do work in those fields and those who regularly work with South Asian LGBTQ communities a better understanding of how to do so. And that, I believe, can ultimately make a real impact. This summer I attended the 2014 Young Leaders Institute (YLI), a leadership development program hosted by South Asian Americans Leading Together (SAALT). 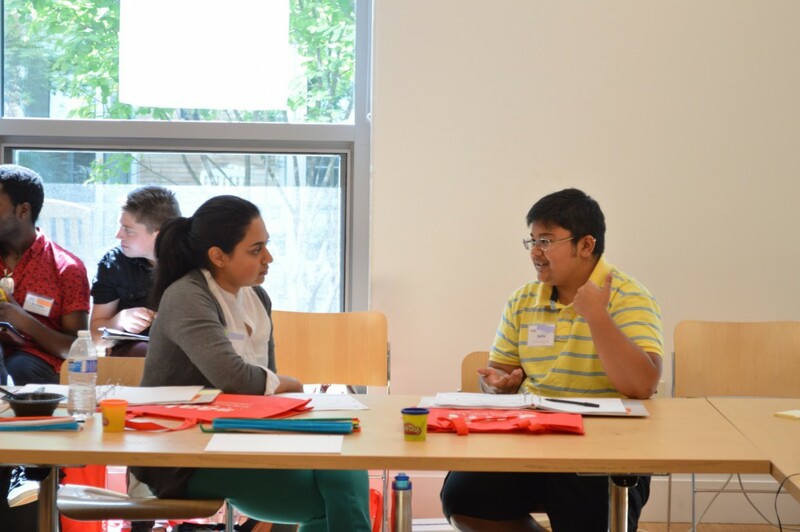 The Young Leaders Institute is an opportunity for undergraduate university students to build leadership skills, connect with fellow activists and advocates, and explore social change strategies around issues that affect South Asian and immigrant communities in the US. 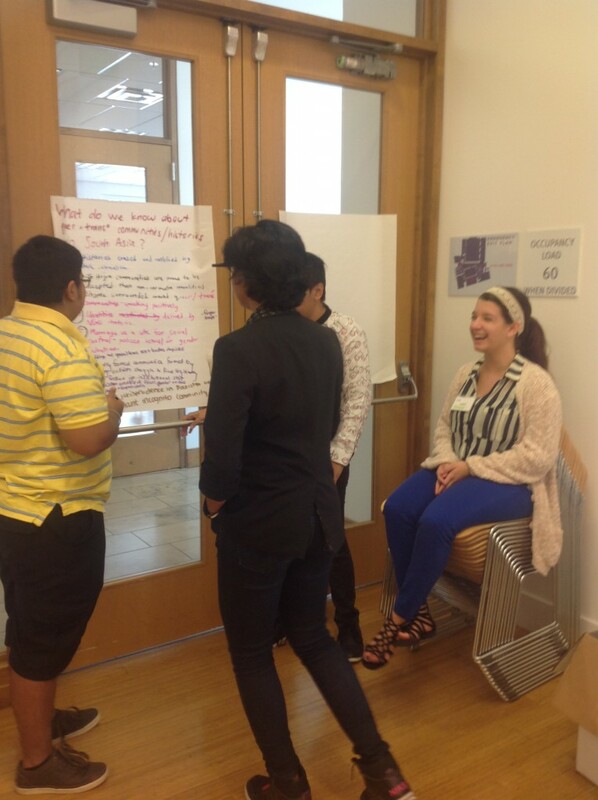 This year, YLI focused on LGBTQ justice and allyship. The theme of this year’s Institute perfectly coincided with an intersectional LGBTQ and Asian student group that I founded a few months prior, Penn Queer & Asian (Penn Q&A). 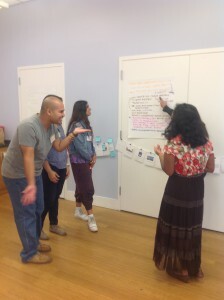 The Young Leaders Institute taught me about LGBTQ issues in some communities that tend to be overlooked and underserved in the broader Asian and Pacific Islander American (API) movement. For example, I learned about the roles that different genders, sexes, and sexualities played throughout the course of South Asian history. 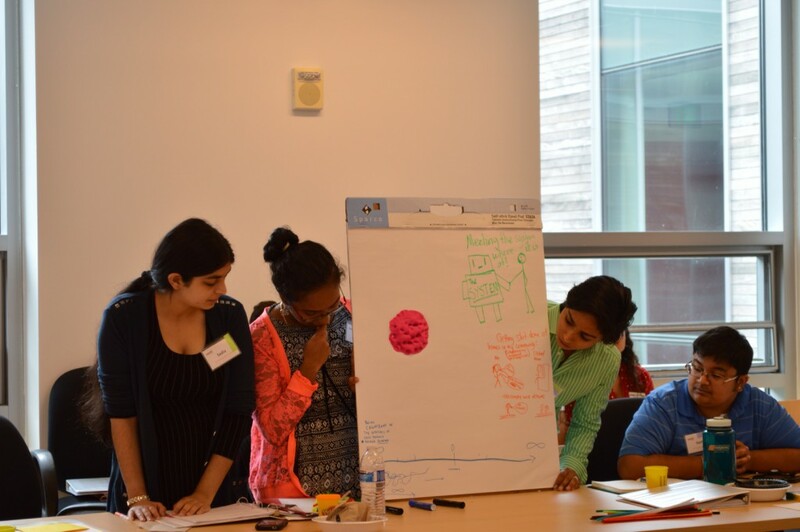 At the end of the leadership training, YLI student leaders had to create projects to enact social change in their communities. For me, it only seemed natural to develop and expand the role of Penn Q&A. Just a matter of weeks ago, the University of Pennsylvania welcomed its students, staff, and faculty back to campus for the start of the 2014 fall semester. For Penn Q&A, the start of the school year meant getting down to business and publicizing our student group to the greater Penn community. Penn Q&A aims to provide a safe space for the support and empowerment of lesbian, gay, bisexual, transgender, queer, questioning, and allied individuals interested in addressing issues surrounding the queer Asian community. As one of the co-founders of Penn Q&A last spring, I attended multiple student activities fairs with my Q&A peers, providing informational flyers, sign-up sheets, and snacks to Penn undergraduate, graduate, and transfer students. We networked at orientation events sponsored by various queer student groups and Asian student groups in order to increase the overall awareness of our organization. By the end of the first week, Penn Q&A had accomplished its outreach goals—I was pleasantly surprised when our listserv expanded to include over fifty queer and Asian-identified members, considering Q&A’s relatively recent establishment and rather niche target population! As the hectic ‘“welcome” and “welcome back” events began to wind down, I realized that Penn Q&A needed to jump through a number of bureaucratic hoops before the student group could properly serve its expanded constituency. As a result, Q&A board members convened early on a Saturday morning to hammer out, scour, and polish our Constitution. Once completed, we submitted our application for official University student group recognition. Just last week, the Office of Student Affairs granted us an official status on the Penn student group roster! Even the Daily Pennsylvanian, Penn’s student-run daily newspaper, recently featured Q&A as one of the campus’ new intersectional organizations. Now a University-certified student group with a website, various social media accounts, and a formidable physical presence, Penn Q&A looks forward to joining student umbrella groups on campus. These umbrella groups provide funding, outreach, and political power for many minority organizations on campus. In the near future, we hope to apply for membership to the Asian Pacific Student Coalition, which oversees Penn’s Asian-interest organizations, and Lambda Alliance, which oversees Penn’s LGBTQ+ organizations, amongst others. Penn Q&A can more readily achieve its mission of supporting queer Asian students by joining these larger student group alliances. Penn Q&A also has a few things planned for this academic year. Internally, we look forward to holding informal mixers for our members, many of whom wish to maintain confidentiality outside of Penn Q&A. In line with what I learned at YLI, Penn Q&A may host workshops to address the intersectionality of South Asian and LGBTQ identities. Externally, we would like to invite speakers and media icons to campus. Penn Q&A has currently planned a collaboration with the Penn Philippine Association to bring Jose Antonio Vargas, a gay, undocumented immigrant, to speak about his intersectional experience of coming to and coming out in America. We also hope to invite Staceyann Chin, a spoken word artist and political activist, and AJ O’Day, a popular YouTube entertainer, to perform and speak to the Penn and greater Philadelphia communities sometime in the future. On a more regional level, I hope to see Penn Q&A holding get-togethers with queer Asian student groups on other campuses and community organizations in the area. Fundamentally, Penn Q&A exists so that queer-identified and Asian-identified individuals know that they are not alone, whether they are in the closet, in the process of coming out, or have already come out. We want to offer our members the opportunity to chat with others about how to deal with sticky situations regarding family expectations, religious tensions, and any other obstacles that arise. At the end of the day, I co-founded Penn Queer and Asian because a handful of queer Asians at Penn wanted to create a safe space for others to feel comfortable in embracing their identities. 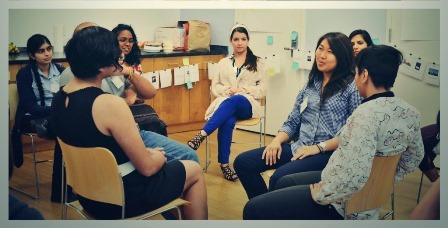 During the Young Leaders Institute 2014, my world drastically changed. People shared stories that captivated, touched, and slightly even hurt me, because of the gruesome reality of some of my peers’ experiences. Entering the training room that day about five minutes late, as I usually do, I had no idea what to expect. I looked around at my twelve other peers and realized that each and every single one had a story that I desperately wanted to learn. Some of them were dressed in a way that I had never seen, while some of them gave off an eclectic vibe, and some matched my eagerness with wide eyes and tender smiles. As the days of training went on, I learned more and more about the struggles my LGBTQ–identified peers faced on a daily basis. The part of the training that impacted me most, as an ally, was when the group was split up and moved to two separate rooms. One group consisted of those that identify as gender non-conforming/trans*, and the other group consisted of allies. When the two groups came back together, we discussed important information concerning sexuality and gender identity that allies should know, as agreed upon by the group of gender nonconforming and trans* individuals. We discussed allyship and explored ways in which allies can offer support while keeping the focus on gender non-conforming/trans* individuals. We learned that the voices of allies should not detract from the stories and experiences of gender non-conforming and trans* communities. I realized that the more I heard them speak, the more they were describing my very own campus project, which is to enable a safe space environment on the campus of Texas Tech University. The development of a safer campus environment will be achieved by forming bonds with faculty and LGBTQ-identified students and promoting events and awareness talks by the Gay Straight Alliance at Texas Tech. I had no idea that some of the approaches my project was using were exactly what my YLI peers were cautioning against! Over the next few days I mustered up the courage to be honest with myself and recognize that I really did not know anything about the way my project should be approached; I had been looking through the same narrow lens that my peers had said felt marginalizing. During the 3-day Institute, I met with beautiful individuals, inside and out, who taught me what accepting oneself and the struggle-filled journey to achieve inner peace really means. I learned that I want to be an ally; my peers’ definition of ally, not society’s definition. I observed their humbleness their kindness and their strong-willed personalities; they taught me to embrace art, love, and good vibes. Overall I have learned that I am just an ally. These are their stories, their struggles, and their fights. I am simply here to support them. In a metaphorical sense, my rain shouldn’t cloud their skies. YLI 2014 changed my views on so many things. I not only walked out more aware of my surroundings, but more aware of myself, my goals, and my aspirations. I gained a stronger understanding of the messages I want to make clear to those in my campus community about acceptance and support and knowing when to take a step back, because the voices that need to be heard are not those of the allies; they are those of the LGBTQ community.